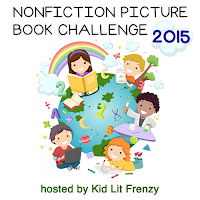 TeacherDance: A Non-Fiction Title-Coming Soon! Thanks to the publisher, I’ve had the pleasure of reading this book before publication, happening August 25th! I’ve seen students study simple machines in the past, from the youngest to the oldest at my school (K-8), and to support them, I’ve scrambled to find many resources that would help them in a discovery process. There needed to be some explanation, a gathering of materials, and then the fun work of experimenting, trying all sorts of ways to try to learn how each kind of machine works. We did do it, but how I wish I had had this wonderful book by Kelly Doudna to help the students learn! Kelly introduces the six simple machines with good basic examples in words and pictures first. For example, a young girl pours her breakfast cereal from a container; it’s an inclined plane. And that, along with the other machines’ examples, shows what they REALLY DO. Each one, when used, gives a mechanical advantage, an important first vocabulary term. The introduction also introduces Archimedes, and like a few other background pages throughout the exercises, it shows a picture, the time period in which he lived, some of what he studied, and a famous quote. Early in the book there is also a visual list of all the common household items needed in order to do the experiments. It will be helpful to those preparing to experiment. An example of one of the Spotlights mentioned. Each machine is thoroughly introduced, and includes what is termed a “Spotlight” (the first picture) which is a real-life example of one of the machines. For example, an airplane’s propeller is shown and defined as a screw, which is an inclined plane wrapped around a core. 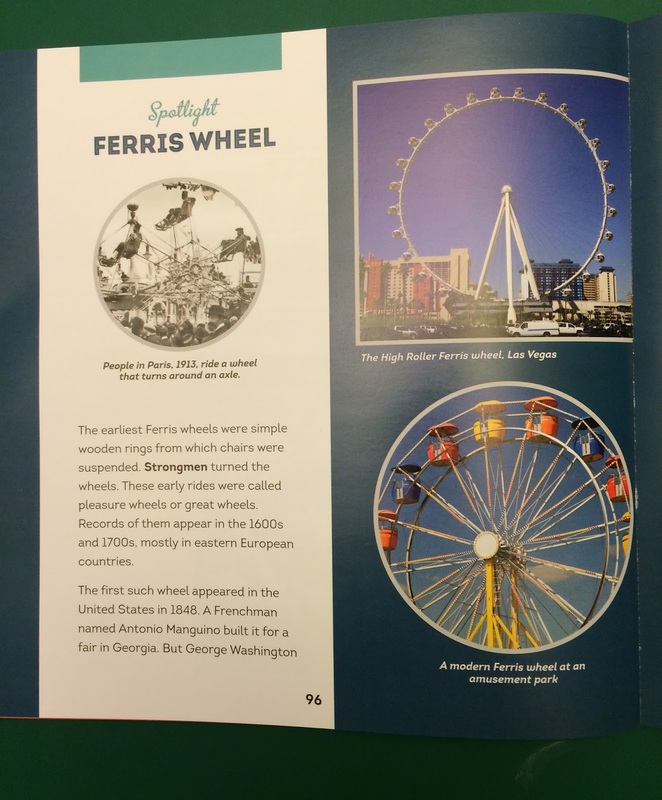 And the ferris wheel (picture above) is introduced in the section about the wheel and axle. Each “Spotlight” offers history along with pictured explanations of the example. My favorite explains the pinball machine! The book is filled with clearly explained information and lots of pictures, along with many application activities. It has a few pictures at the back in order to see if you can identify the simple machines in use, and a brief historical piece about Rube Goldberg. I imagine that not only should a school’s library have one of these books, each classroom will benefit from this terrific resource. 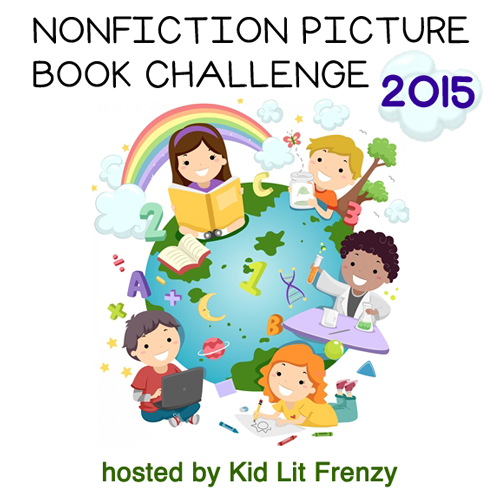 It's a book both entertaining and educational! Sounds nifty! 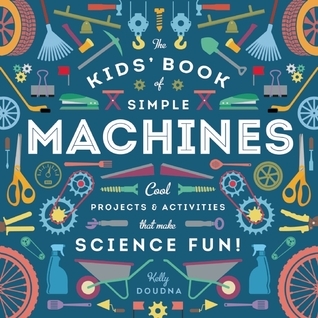 I wrote a Science Songs book about simple machines years ago (http://amzn.to/1NaCTdb), and it's a cool topic. This more in-depth look at the topic looks interesting. Thanks! Oh, wow, Laura, I'll look for your book. I didn't know. This book seems like it would be such good learning and fun! Thanks for spotlighting this, one of our grade levels studies machines, I will definitely be passing this along! Glad you already have a place to share. Thanks Michele! You're welcome, Fats. It certainly is good. I can see so many ways that teachers and students could use it and learn from it. How great, Buffy. I will look for it, and share with the librarian at school. This is a good book, but different books fill different needs. Thanks for telling me!